The Pikes Peak Summit Complex, located just above 14,000 feet, will include a US Army high-altitude research center and a visitor center. Courtesy GE Johnson. Pikes Peak will take your breath away. The tallest of the Rocky Mountains’ southern Front Range, it rises 14,115 feet just west of Colorado Springs, Colorado. At that height, everything is magnificent, and nothing is easy. Its allure was captured perfectly by Katharine Lee Bates, the professor and poet who penned the lyrics to “America the Beautiful” after a trip to the summit in 1893. But Pikes Peak isn’t just beautiful. It’s also brutal. Alongside spectacular views of “amber waves of grain” and “purple mountain majesties” are thin air, violent storms, and treacherous slopes. In that extreme environment, it’s hard to breathe, let alone build. But that’s what Colorado-based construction firm GE Johnson will be doing for the next three years. In June 2018, it broke ground on a $50 million project, the 38,000-square-foot Pikes Peak Summit Complex at the top of the mountain. 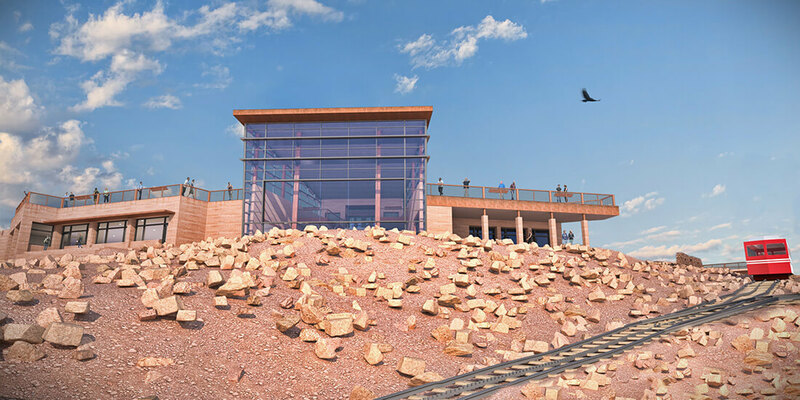 Scheduled for fall 2020, the site will include a new US Army High-Altitude Research Laboratory and Summit Visitor Center that will be the beloved crown on top of Pikes Peak’s hallowed head. “Everything you do has to be at the next level because you’re in an extreme climate,” says Steve Eikanger, GE Johnson’s director of integrated services. Established in 1967, the firm has been building at high altitudes since 1975, when it constructed eight schools in rural Rocky Mountain communities for Colorado’s Eagle County School District. GE Johnson’s first mountain resort came in 1987: a Westin hotel in Vail, Colorado, where it built a $10.5 million addition during a brutal winter. 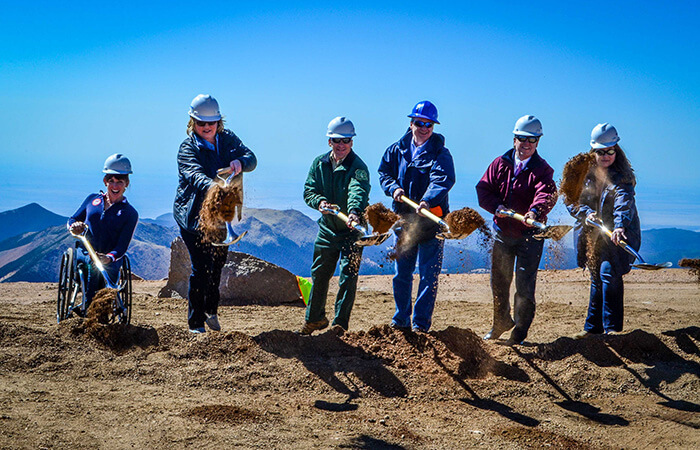 The GE Johnson team breaks ground atop Pikes Peak. Courtesy GE Johnson. With climate change promising to dramatically alter global environments, extreme construction skills may become more valuable than ever for work in challenging locations, climates, and conditions. Perhaps the most obvious obstacle in extreme environments is weather. In the Rocky Mountains, there’s snow—lots of it. To cope, design teams must reconsider processes such as waterproofing, Eikanger says. Where a first-story roof meets a second-story wall, for example, a waterproofing membrane may need to extend four feet up on the wall due to the four feet of snow that will sit on the roof for most of the winter. That snow might also require snowmelt systems for public walkways and steel instead of wood-frame construction to accommodate its weight. A favorite strategy is enclosure, according to Eikanger, who recalls building an eight-story Sheraton hotel in Avon, Colorado, in the thick of winter. Instead of stopping work for the season, GE Johnson installed a temporary roof on the structure and enclosed it inside a massive tent. “All of the finish work—the windows, the stucco, the stone—went on inside a tempered area that surrounded the entire structure, so we never had to slow down the prefabricated construction schedule,” Eikanger says. On Pikes Peak, extreme winter conditions sometimes prevent crews from reaching the summit, so GE Johnson prefabricates some building components off-site. Courtesy GE Johnson. Instead of a tent, the team at Pikes Peak plans to utilize off-site construction. “We will be working on the project year-round; it just may not be at the summit,” Eikanger says. Workers will spend winters prefabricating building components such as rebar cages, roof structures, and the exterior walls that will protect the interior. 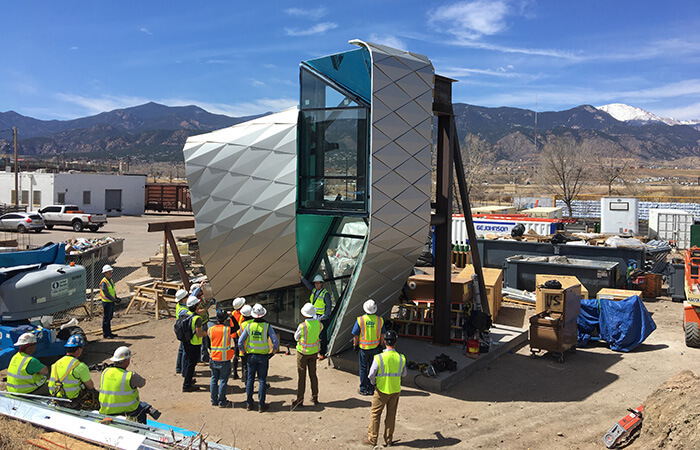 All modules will be constructed in nearby Colorado Springs, then transported to the jobsite in a special roll-off truck with an optimal length and turn radius ideal for navigating the extreme switchbacks of Pikes Peak’s ascent. 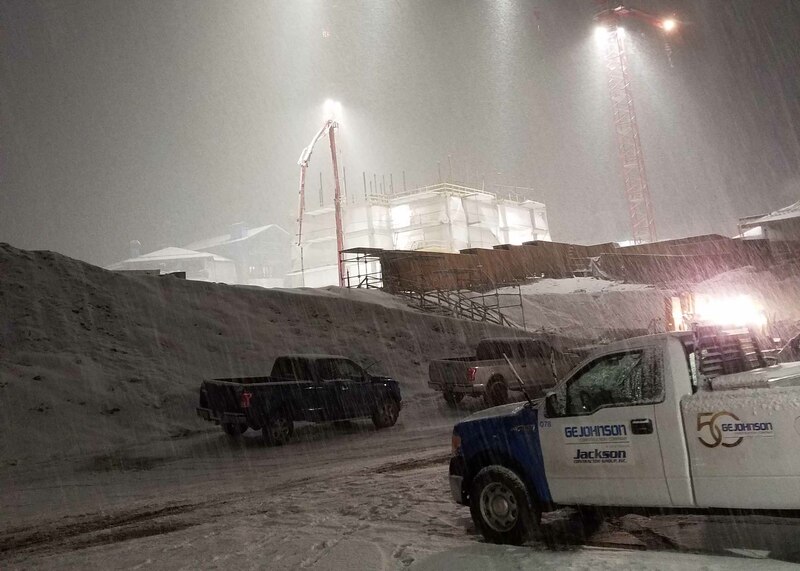 Builders in extreme environments have to consider not only the weather but also the workers, according to GE Johnson Communications Director Laura Rinker. “We have to manage how we tend to people working on the project, ensuring that their vital signs are good and that they have shorter work days than at a lower altitude,” Rinker says. On the Pikes Peak project, GE Johnson has partnered with University of Colorado Denver to develop a health and safety monitoring system for workers. Keep your project on track—and on budget. Using student volunteers from the US Air Force Academy in Colorado Springs, researchers measured participants’ vital signs as they performed various occupational tasks at altitude. The result was a physiological baseline for workers. If they show signs of altitude sickness or other distress, an on-site emergency medical technician (EMT), safety specialist, or paramedic will intervene. 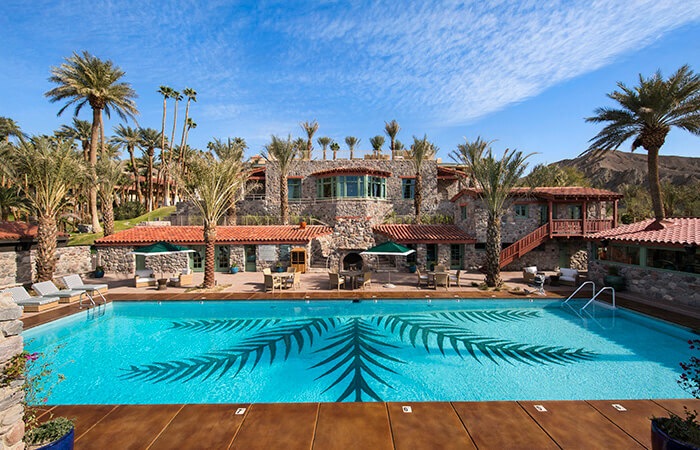 Similar risks exist at the opposite extreme: In California’s Death Valley, where GE Johnson recently completed a multimillion-dollar renovation of The Oasis at Death Valley, formerly Furnace Creek Resort. Because it’s located 148 feet below sea level, altitude isn’t a problem—but with summer temperatures reaching as high as 125 degrees Fahrenheit, heat is the killer. For their safety, crews worked evenings. Because Death Valley’s daytime temperatures regularly soar to 120-plus degrees Fahrenheit, construction crews built The Oasis at Death Valley at night. Courtesy GE Johnson. Extreme locations also tend to be remote—places where labor can be as hard to attract as it is to protect. Again, prefabrication can help. In Death Valley, for instance, major building systems are prefabricated in Las Vegas and Fresno, California, where the trades and materials needed are more accessible. At the US Olympic Museum site, crews scan metals at various times of day to monitor temperature-related expansion and contraction. Courtesy GE Johnson. Because resources in extreme environments are scarce, efficiency is paramount. “We have to make sure all systems get coordinated before they ever get built out in the field,” says Eikanger, who adds that virtual models allow general contractors to anticipate necessary labor, materials, and logistics. Once the teams are in the field, technology also helps them communicate and manage quality control more efficiently. Using BIM 360, they create punch lists and QA checklists with photos, assign action items to team members, and send notifications. Meanwhile, for the United States Olympic Museum in Colorado Springs—which it’s currently building at a 6,035-foot elevation—GE Johnson is using 3D laser scanning for quality control. Because heat and altitude may cause metals to expand slightly, the team scans exterior framing and interior panel walls twice a day—in the morning and afternoon—to verify dimensions and correct errors in real time.